Oysters don't come any fresher than at Southern Rock Seafood. The assurance comes from Josh Green, the driving force behind Southern Rock Seafood Sdn Bhd – KL's leading high quality seafood importer and supplier to leading hotels and restaurants since 2008. Josh whose passion for fresh fish and seafood runs deep as the ocean ventured into opening the first SHUCKED Oyster and Seafood Bar in 2012 at Publika followed by another at The Gardens mall in 2014. Come February 2015, Southern Rock became a proper restaurant and has since expanded into two shop premises. A bundle of dynamic energy, Josh can talk for hours about his treasure trove of imported fishes, shellfish and seafood from Australia, New Zealand and Europe. He even knows the hard-working oyster farmers from Ireland and the fishermen he does business with. Step into Southern Rock Seafood Restaurant in Bangsar and a chalkboard listing the freshest catch available displayed prominently to catch the eye. The interior bears a seafaring and nautical theme; painted in shades of breezy blue complemented by a feature wall of weathered effect clapboards. Traditional fishing traps double up as light shades, evoking shadowy patterns onto sturdy wooden chairs and tables. A fresh oyster bar where beds of chipped ice adorned with various types of oysters also takes pride of place here. Just a door away is the Southern Rock seafood retail shop where customers can pop in to buy the company's wide range of fine fish and seafood. After a hard day at work, nothing beats rocking up to the bar for a punchy Bloody Mary followed by a sublime Oyster Shooter (RM15 each, RM75 - 6 glasses). Another go-to house cocktail is The London No.1 Special, a fruity fresh concoction laced with gin. Oyster fans can expect to be reeled in by The Kitchen Dozen (RM188) - an assortment of Southern Rock Seafood's shell 'stars'. On our visit, we savoured 6 different varieties including Gallagher Special, Irish Premium, Streaky Bay (Oz), Cloudy Bay (NZ), Fine de Claire (France) and Creuses (Holland). Depending on your preferred choices, prices range from RM35 (for 3 pcs) up to RM220 (for a dozen). Like wine, oysters have distinctive flavour and body - reflecting the waters they are raised in. Diners can pick up oyster tasting guide booklets at Southern Rock which gives informative notes on each type so they can better appreciate the live, fresh molluscs. 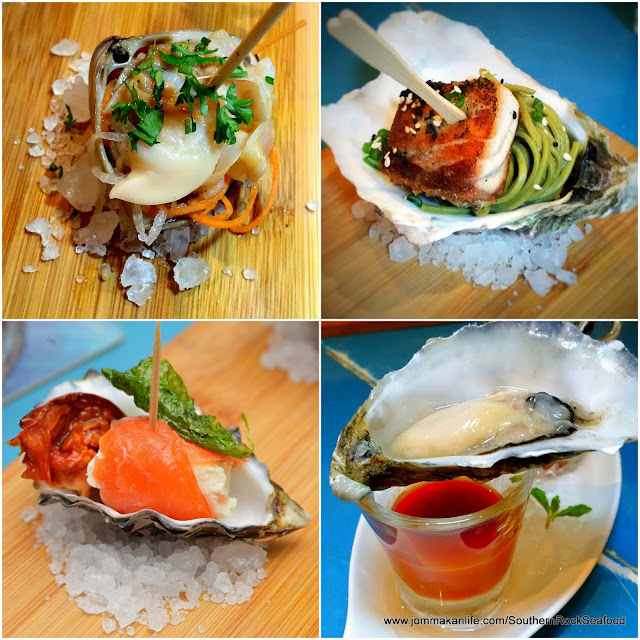 Josh also treated us to sumptuous samplings from his gastronomy fest menu (from top left): semi naked Cloudy Bay Diamond Shell Clam, Ponzu Soba Noodles with Barramundi, Tragheanna Bay Oyster & Bloody Mary, and Smoked Ocean Trout with Marinated Goat's Cheese. If you have the chance, try the Lobster Bisque with Caviar too. Rich, thick and brimming with deep seaworthy accents, we relished the lush tasty soup down to the last drop. Slices of crusty toasted housemade bread serve as the ideal canvas to capture the briny delicacy of Herring Matjes (RM38). The assertive flavour of pickled herring may be an acquired taste for some but accompanied by chopped onion, parsley and dried tomato, the savouriness is sought-after by fine food fans. Local palates yearning for a spice hit would welcome Southern Rock's Legendary Laksa with Mussels (RM56-small, RM88-big). Featuring live Boston Bay blue mussels, the sweet shellfish morsels in aromatic 'masak lemak'-style gravy easily reel you in. We suggest dunking toasty slices of the house bread to relish the delicious gravy. The chefs also whip up a fab Angel Hair Mussel Laksa (RM36) version. Sashimi connoisseurs can look forward to shelled Canadian Scallops (RM30 for 70g). Their delicate fresh sweetness is as good as any served at the finest Japanese restaurant. Craving for seasonal fish catches from Oz, NZ or Europe? Fret no more as Southern Rock always has a plethora to reel you in. Fish and carb landlubbers may bid 'ahoy' to grilled Barramundi with Squid Ink Pasta with Pot Roasted Veggies (RM88). The notably sweet slab of fish should float your boat coupled with the al dente pasta. More exotic to local diners would be the Alfonsino with Arugula Salad & Croquettes (RM66). Drizzled with a lightly creamy herbed sauce, this deep water fish is prized for its firm white flesh and high oil content. From the pristine waters of NZ comes Tarakihi with Grilled Veggies & Sauteed Potatoes (RM77). 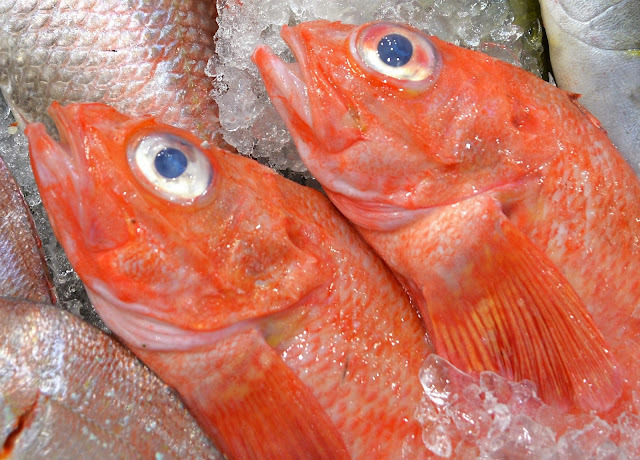 I like its moist, slightly firm white flesh which tastes almost similar to snapper. In Europe especially France, Lemon Sole a la Muniere (RM66) is a classic dish that sends fish connoisseurs into rapture. While I understand the appeal lies in the fish's fine flesh, I'm not big on this particular offering possibly due to the heavy tartness of capers. It must be my Chineseness coming through when I silently lament over the Sea Perch with Anchovy Dressing & Herbed Mash (RM72) and Grilled Ocean Trout (RM65). Thanks to years of training by Dad who is finicky about fish doneness, I can hardly bear overcooked fish as in these two instances. Both offerings would have been superb when deftly acquitted. Brownie (RM23) is supplied by Baked with Dignity - a social enterprise to empower persons with learning disabilities to train, learn and earn a living through baking and sales of their baked goods. Dense and wickedly chocolatey, the decadent dessert is best shared for greater enjoyment. I'm partial to the Lemon Torte (RM26) with its irresistibly light crust and zesty lemon custard filling. Assorted fruit slices alleviate the ample wedge further; a nice way to lessen the guilt. Feather-light Pavlova with Chocolate Mousse & Summer Berries (RM23) is another worthy option for the sweet toothed. The abundance of fresh blueberries, raspberries and strawberries along with promegranate seeds lend extra appeal to the pavlova and choc mousse pairing. You can rest assured this tempting treat won't leave you on a sugar high or guilt-ridden. For reservations at SOUTHERN ROCK SEAFOOD, call tel: 03-28562016 or 012-385 0266. Address: 32-34, Jalan Kemuja, Bangsar, KL.